Zocular® recently introduced its new ZocuFoam™ foaming cleanser and ZocuWipes™ pre-moistened, single-packet pads for treating the discomfort and other eye problems, such as styes, associated with dry eye. 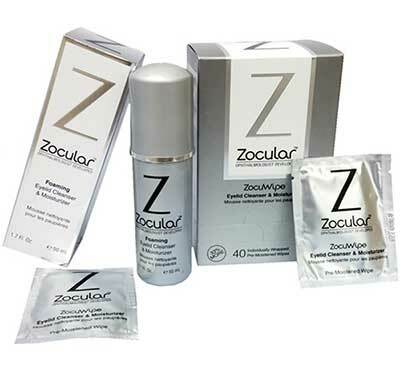 Zocular® products are the result of transformative research and development on dry eye by Dr. Peter Pham. The link between the eye and skin led to the development of a natural and proprietary activated okra complex called ZokrexTM. Our okra-based formulation with Zokrex changes the parardigm for both eye care and skin care by catering to the intrinsic needs of your eye and skin with natural solutions, not with harsh drugs or synthetic compounds. We recently introduced the ZocuKitTM Professional Eyelid Intervention System to provide eye care professionals with most gentle, convenient, and effective platform to address almost any eyelid issue. ZocuKitTM is an in-office procedure performed at TSO Corinthian’s office to help your eyes feel and look better. If you haven’t experienced the amazing results with ZocuKit, schedule an appointment at TSO Corinthian Pointe Experience the Zocular® difference for yourself! And since Zocular addresses the primary cause of inflammation associated with eyelid margin acnes, the company reports the products are also effective in treating facial acnes, as well as helping to heal wounds. Texas State Optical Corinthian Pointe carries the full line of Zocular products for the treatment of dry eye. Please schedule an appointment to treat your mild or severe dry eye.